The Cornhusker Marching Band Exhibition will be held this Friday, August 17th at Memorial Stadium in Lincoln, NE at 7 p.m. The event is FREE and open to the public! Enter Memorial Stadium through Gate 3 (SW Entrance) and Gate 11 (NW Entrance) Gates open at 6 p.m. 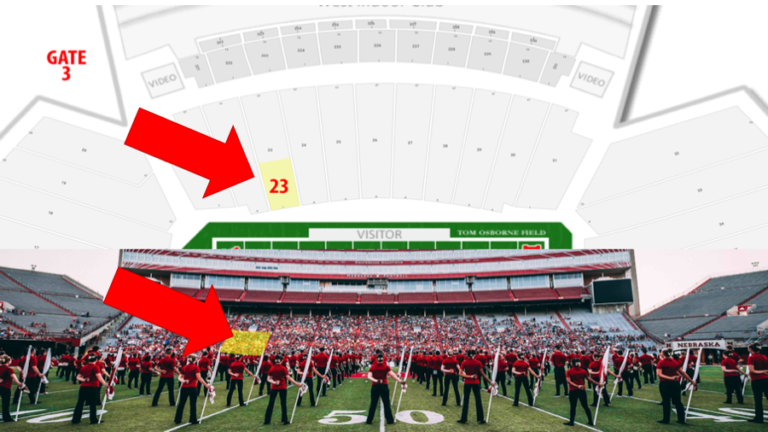 This year, we will have section 23 designated as the ‘CMB Alumni Section’! We invite all alumni and their families to sit together. Look for the BAA banner and signs. We’d love to get a picture of everyone together! As we gear up for our annual reunion it is a great time to bring you up to speed on what has been happening in the band department. There is a lot to celebrate! Since we saw you last September, we welcomed two guest artists to campus to work with the ensembles thanks to the Donald Lentz Memorial Band Fund. The symphonic band performed a ground-breaking concert devoted to female composers, collaborating with special guest Rachel Whelan, and the wind ensemble, symphonic band, and graduate band conductors all worked with conductor Jake Wallace when he was in residence in the spring. This December we will welcome Pulitzer Prize nominee Carter Pann to campus as composer in residence with the wind ensemble, conducting, composition, and piano studios. Composer Stacy Garrop will be with us in April to collaborate in a consortium premiere with Paul Haar and the wind ensemble. I think Donald Lentz would be proud of the variety and quality of experiences his namesake fund supports. Foundation funds and alumni donations also support our very active and influential commissioning program through which the Nebraska bands have gained a national reputation for innovation and excellence. Last year we completed projects with Larry Tuttle, Stacy Garrop, Ryan Lindveit, David Maslanka, and Carter Pann. We are currently working with John Mackey, Michale Krueger, James Syler, and Zhou Tian. Check out their websites to get a sense of the spectrum of styles, textures, and compositional languages to which our students are gaining direct access. As you can sense, the whole department has been busy. The wind ensemble was featured at the Nebraska Music Educators Association Conference in November and engaged in a special partnership with the Lincoln Symphony Orchestra during the annual Winter Festival for Winds and Percussion in January. In addition to a full home season, the Cornhusker Marching Band performed a special exhibition at the Nebraska State Bandmasters Association State Marching Contest to great acclaim. Big Red Express was busier than ever with a national championship run in volleyball, and a particularly complex tournament season for basketball, and the Campus Bands are bigger than ever thanks to the creativity and energy of our Graduate Assistants. All of this activity is supported by alumni and generous donors in yet another way: scholarships. Each year we are fortunate to be able to award more than $14,000 to outstanding students in our band program. Wonderful as this is, it’s a drop in the bucket when you consider that there are more than 400 students involved in UNL bands and tuition and fees are rising. $14,000 covers awards to just 14 students. We hope you’ll be inspired to contribute in whatever way inspires you: scholarships (Jack Snider Band Alumni Fund), guest artists (Donald Lentz Memorial Band Fund), or general operations such as “The Ride of All Nebraska”, the semi-trailer, instruments, raincoats, iPad drill software, etc. (University of Nebraska Foundation and/or Jack Snider Band Alumni Fund). You may have graduated, but your spirit and influence is still felt in the work we do each day. Thank you for your support and encouragement, and Go Big Red! Registration for Sept 14/15 Reunion is OPEN! We hope you can join us for this year’s reunion! See the tabs on the menu of our website for more information and details! Registration Opens Soon/Alumni Instruments Repaired! Registration is coming! We are working on final adjustments to the registration site and we hope to have that up and ready for you within the week! Uniform is now black shorts/pants with a red shirt and any comfortable shoes (no flip flops, please)! Post game party will be held at the Student Union this year from 3-6 p.m. We are looking into a taco bar! We are so fortunate to be able to provide some instruments to our alums for reunion weekend. These instruments are used year after year and require maintenance such as removing dents, oiling slides and valves, replacing/repairing pads, etc. We want to ensure that the instruments remain in good working condition so that each year we have as many available as needed for alums to borrow in order to participate in the marching portion of the reunion weekend. Currently, we charge $15/rental. On average, we rent 35 instruments per reunion weekend. We went ahead and repaired/cleaned all alumni instruments this summer- thanks, Palmer Music! The total cost of this project was just under $5300. We would like to keep these instruments in good working condition as well as keep the rental cost at $15/instrument. Therefore, we would like to ask you all for additional donations for this substantial cost. You can send a check to us (PO Box 6266 Lincoln, NE 68506) or when you register for reunion weekend, donate in the “other” category and write in “instrument repair fund”. We would greatly appreciate it!